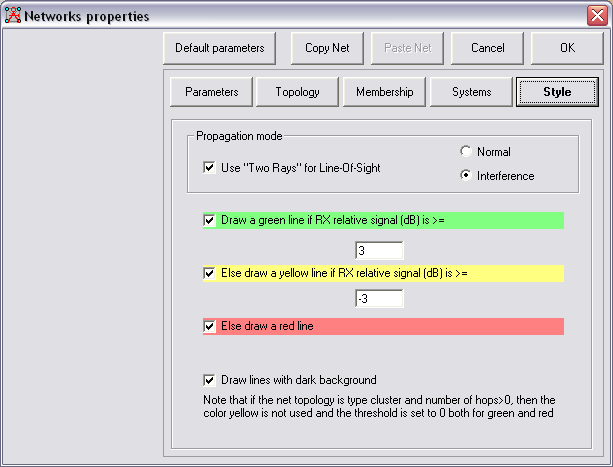 User can select color and threshold for network drawing. Depending on the requirements of the user Radio Link lines can be drawn in a specific color. Draw a green line if the received signal is stronger than the minimum receive level of the receiver + x (3) dB. Draw a yellow line if the received signal is weaker than the minimum receive level of the receiver + x (3) dB AND stronger than the minimum receive level of the receiver - y (3) dB. Draw a red line if the received signal is weaker than the minimum receive level of the receiver - x (3) dB. If checked the link lines will be drawn annotated.